User points of interest can be added to map several ways - by creating new points from scratch, by creating new points with some predefined parameters or by importing them from outside of Locus. 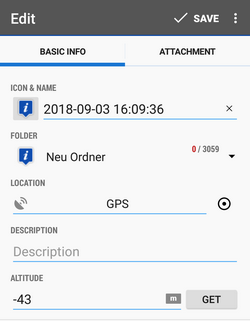 New points are automatically created on your actual GPS position. There is an option to create new points on position of the map cursor but you need to set it up in points settings >>. - fills all attributes of the search result in the point detail dialog. Points created this way are “waypoints” existing only within the recorded track. Some point-related operations can not be performed with them, e.g. displaying them individually or copying them. Icon & Name - default new point icon is given by context. E.g. when you create a new point in a specific folder, the point has icon of the folder. It can be changed - just tap and choose from selection of Locus and Garmin style. If you leave it as it is, no specific icon will be associated with the point and it may be changed when the point folder icon changes. The name is by default a time stamp of creating the point and can be edited too. Name is one of the main point identifiers so it is not possible to save a no name point. Altitude - height of the point above the sea level. If it is empty Locus Map can obtain it from offline elevation files (Locus Map Pro only) - tap Get.